If your party hosting facility, office, or banquet facility is looking for new disposable decorations, orange streamers are a great choice. 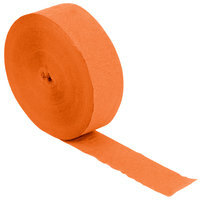 Perfect for Halloween or fall parties, orange streamers are made of flexible textured crepe paper. After your event, you can simply throw them away for quick and easy cleanup. Orange streamers can be mixed and matched with products in colors like black, yellow, and white, which will create eye-catching contrast at your event. You can even twist these decorations into a corkscrew pattern and hang them from tables, wall sconces, doorways, or ceilings. 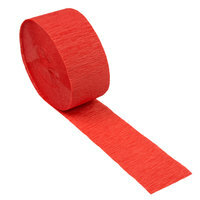 Best of all, they are sold in large quantities at low prices, making them a cost-effective decorating choice. For related products, check out our disposable Halloween party supplies, party plates, and paper napkins. 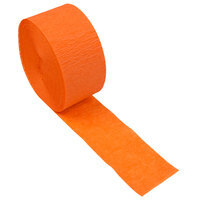 If you're wondering where to buy orange streamers, we have a large selection of orange streamers for sale at the lowest prices.